Cynthia García Coll is the Charles Pitts Robinson and John Palmer Barstow Professor of Education, Psychology and Pediatrics at Brown University. Her research focuses on sociocultural and biological influences on child development, with particular emphasis on at-risk and minority populations. García Coll has served on the editorial boards of leading academic journals, including Child Development, Development and Psychopathology, Infant Behavior and Development, Infancy and Human Development, and is the current Editor of Developmental Psychology. She was a member of the MacArthur Foundation Network “Successful Pathways Through Middle Childhood” from 1994-2002. 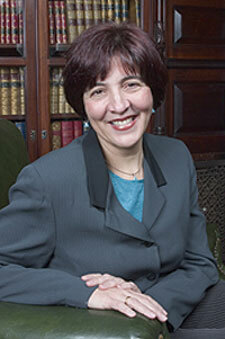 García Coll has co-edited several books: The Psychosocial Development of Puerto Rican Women; Puerto Rican Women and Children: Issues in Health, Growth and Development; Mothering Against the Odds: Diverse Voices of Contemporary Mothers; and Nature and Nurture: The Complex Interplay of Genetic and Environmental Influences on Human Behavior and Development. APSSC: What led you to choose psychology as a career? C.G.C. : I have always been interested in understanding people better. What brings them to do what they do, and to feel and think how they do? My first psychology course was in high school as a junior. That was all I needed. APSSC: How did you go about developing your current research interests and how have they influenced you as a person and a professional? C.G.C. : I have done a lot of different research. When I am intrigued by a phenomenon, I just go for it! Most of my research is about how youths develop as a function of living in at risk environments or having been placed at risk because of who they are (such as children of teen mothers). Nowadays, I am studying children of immigrants, but I am interested in both risk and resilience in these populations. My research topics are all very close to me. That is part of the appeal. APSSC: What suggestions do you have for choosing an area of study within a field as large and diverse as psychology? C.G.C. : In psychology, and in any other field, you need to follow what you are passionate about. We work hard and long hours, and what keeps us going is that spark that we get when we see the product of our work. It is a very personal thing. APSSC: How did you go about selecting a graduate program? C.G.C. : It’s partly the quality of the program and partly the location (where in the United States). I tell my students that graduate school is all about mentorship, so there should be at least two faculty members that you can work with. APSSC: What were the most rewarding aspects of graduate school for you? C.G.C. : Presenting my own research in conferences! After my first year, I was already doing a presentation of my first-year project. Receiving feedback from peers, as well as from established people in the field, was just spectacular. APSSC: How does a graduate student work towards becoming a first-rate researcher? C.G.C. : You need to become knowledgeable with the history and the theoretical foundations of the field. Conduct as much research as you can. Start with questions closely related to your advisor’s work, and move on to try to do “your own thing.” Think out of the box if you can, but be solid in theory and methodology. And then publish, publish, publish. APSSC: What are some of the common mistakes you see graduate students and young professionals making? C.G.C. : Creating projects that are too ambitious. Think narrow and doable. You just have to answer a part of the question. You have a lifetime to answer the whole question. APSSC: What advice would you give to graduate students who want to have careers in academia? C.G.C. : Come out from your doctoral program with various pieces of work in press. If not, do a post-doc that will allow you to publish. Until you get tenure, do “all the right things” (talk to members of your department to find out what these are), but especially publish in high impact journals. Go to national conferences, and get others to know your work. You will need letters of recommendation from top people in the field for your tenure case. So do not be shy, introduce yourself, and send them your work. Of course, in some programs, obtaining external grants is necessary. Also start small and create a track record. Publications and grants are a matter of perseverance — just keep on trying. APSSC: Writing and publishing are often anxiety provoking events for graduate students. You have had a great deal of experience as a writer, editor, and reviewer. What do you know now about this process that you wish you would have known earlier in your career? C.G.C. : It gets easier with time, and several drafts are fine! Ask for feedback from more senior colleagues if you can, but also seek out junior faculty or peers. Each journal and each outlet has its own culture. Do not write without taking into account where it will be published. Get other articles and such from the particular publication outlet. Mimic the way the article is written. And publishing is perseverance. Of course we want to publish in the best journals, but second best is to get published, period. Take the rejection and the reviews, modify the manuscript, and send it out ASAP. APSSC: Much of your work has focused on ethnic identity as a context for development. How can we as psychologists get better at understanding how ethnicity and culture moderate human behavior? How can we better incorporate such factors into our research and practice? C.G.C. : In some theoretical frameworks, culture/ethnicity is placed at the most distant concentric circle. In my own work (see Garcia Coll et al., 1996), I have argued that these forces permeate all the microsystems that youth are part of. And the issue is when racism, prejudice, and discrimination are the responses to members of different cultures and ethnic/racial groups by the majority. A culture’s deficiencies are in the eye of the beholder. But they are very real in the lack of resources created by segregation. For that reason, I talk about at-risk environments and not at-risk youth or family. I also talk about our lack of knowledge of normative development, rather than documenting more deficits. It is our cultural lenses that judge others as deficient and not as normative responses to at-risk/deprived environments. Culture/ ethnicity/racism are fundamental in understanding so-called minority populations. They need to be at the core of our practices, policies, and interventions — our approach cannot be after the fact or color-blind. APSSC: How can psychology best increase public awareness of research in this area and affect public policy? C.G.C. : By documenting the strengths of individuals and populations. By documenting that it is the environments that are not serving youth development — it’s not deficits in the youth. By developing interventions that work at both promoting development and capitalizing on current strengths but also on improving the environments of youth. Many of our policies and practices do not work because they are framed in individualistic deficit models or do not address the lack of resources in critical environments. APSSC: How has what you’ve learned through your research influenced how you live your life? C.G.C. : I am more an activist now than ever. I am also frustrated by the fact that we know so much and so little of that knowledge is been integrated in practice or policy. So I am more interested in talking to the media and making connections between what we know and the development of interventions. APSSC: What do you see in the future for the field of psychology? C.G.C. : I would love to see it becoming part of effective interventions on behalf of children and their families. There is a superficial use of psychology; I want a deeper marriage. APSSC: Is there a question that you wish I had asked? What would your answer have been? C.G.C. : I feel very lucky to have chosen a field that is so rich and rewarding. Being an academic psychologist is the best. We work hard but we have a lot of choices in our work hours and the projects and topics we work on. And you get paid to learn and to do what you love each day! APSSC: Thank you for taking the time to answer these questions and for your myriad contributions to the field of psychology!